The Boulder Creek Grill offers a dining experience to remember. The restaurant can provide both an intimate atmosphere for a small party, or a more celebratory atmosphere for up to 100. Our upscale restaurant features fabulous cuisine, and our experienced staff strives to leave each guest feeling like they have been welcomed into a good friend's home. It is our goal to win you over with our outstanding service and leave you with a smile on your face. Choose from a variety of food, beverages, and amenities packages. 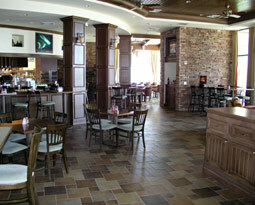 The beautiful setting, professional staff, and quality service of the Boulder Creek Grill await you.